It’s gardening season! The spring is a wonderful time to get out in nature with our children and dig in the dirt. It is a relaxing way to learn all about the wonders of creation. Nothing is quite as wonderful as the smell of freshly turned dirt ready for planting. Getting our kids involved can sometimes be a chore, so finding fun ways to make gardening delightful for them is important. One fantastic way to do this is by helping them make a worm farm! Worms help to increase the amount of air and water that gets into the soil by aerating it when they dig their tunnels. They eat and break down organic things like leaves and grass into castings that are a valuable and rich type of fertilizer. Earthworms are awesome (free) garden helpers. And they are wiggly, squirmy, and sort of gross which means they are fun for kids. The feeling of playing with your kids while looking for worms after a downpour is a refreshing one. To have your daughter or son dangle or chase you around the garden with a worm can be a great outdoor activity. It induces much laughter and makes precious memories. If you want to get your homeschooling kids involved in the garden, what better way to start than to teach them about taking care of the environment? Create a worm farm full of creepy, crawly, delightful garden tending worms using the tips we have offered here. You need a decent container with an airtight lid to start off this project. To make it even more interesting for the kids, get a transparent one. Dollar store plastic bins are excellent for this. Create some air holes at the top of the container and at the bottom for drainage. You will want to add a cover to keep hungry birds away. If you want to spark curiosity in those young minds, a good way to do it would be to use garden soil that is layered for a great look at how the worms help with decomposition and the creation of rich, fertile soil. Go ahead and shred up some newspaper (not the ad papers, just the black, and white paper parts), placing the shreds in the container before adding your garden soil. Make sure the bed is moist. Spraying it with a misting bottle is a good way to dampen it without getting it too wet. At this point, the kids will be pretty excited for getting some worms to facilitate the start of a worm family. 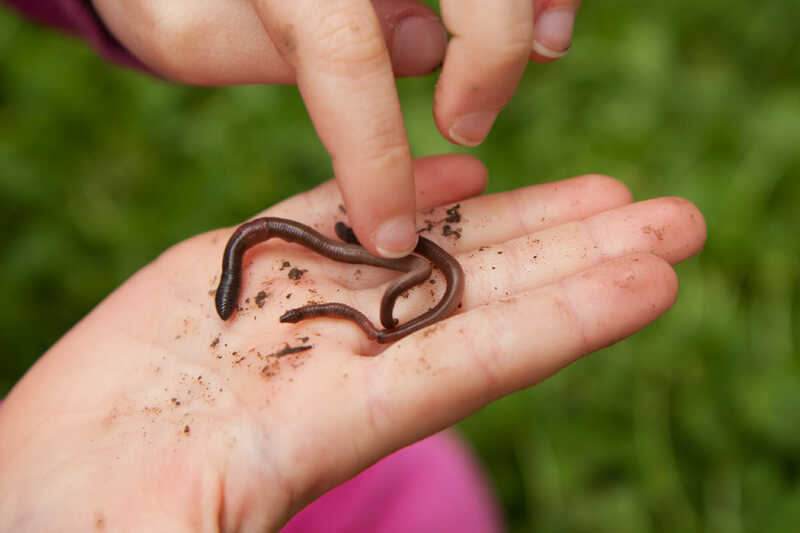 To make things easier (or less messy) you can skip digging in the garden by actually ordering worms online or simply picking some up from a local bait shop or garden center. Our local Walmart carries them all year. What you need to choose are the red worms that are usually found closer to the surface. During this process, talk to your kids about how to handle worms and you can also drop a fun fact about how there are 34,000 different types of worms on the planet. Now that you have your farm populated with worms, it’s time for them to feed. Worms feed on scraps of food and vegetables. A great way to get the kids involved is to have them collect vegetable scraps to keep for the worms. Don’t use meat scraps or dairy foods since they can become a breeding ground for maggots that might contaminate your worm farm. The worm feeding process will go much easier if you add small pieces in small amounts, so don’t sump all your veggie scraps in at once. Worms don’t have lungs – they use their skin for breathing. Because of this, you need to teach your children to protect the farm from direct sunlight since it will dry up the skin of the worms and possibly kill them. Teach your kids how to care for the farm by using a trowel to turn the bedding every once in a while. This helps with oxygen circulation in the farm and gives the worms a fresh place to dig. With time, as the worms turn the scraps of newspaper and veggies into fertile soil, you can start using the new, rich soil when gardening with your kids. Worms make great pets, after all!